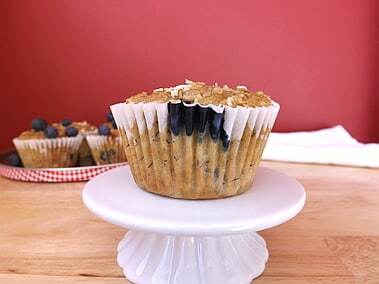 Lately I have started a real appreciation for muffins; to be honest I’ve always considered them very much an American breakfast staple and not really a British treat. Though in the last few years they are turning up more and more in the shops, sold as afternoon treats. But I think my real appreciation has come from the several American blogs I read on a regular basis. They are always full of really scrumptious looking muffins and I thought it was time I got on this train! To be honest I did used to believe they were just cupcakes without the frosting, but I think muffins offer so much more and in some ways far more interesting then cupcakes. 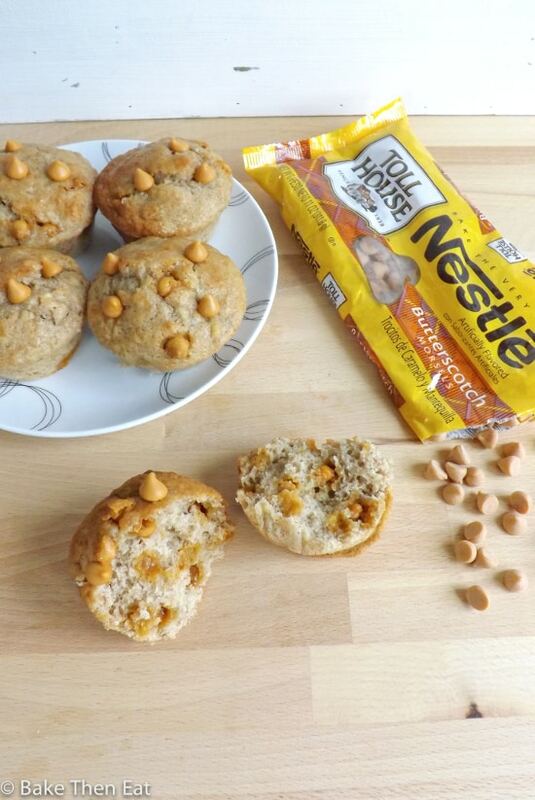 You can really experiment with muffins. Some use applesauce or bananas like these do to sweeten them up and some use oil, yogurt, coconut oil or buttermilk, like these instead of a more traditional fat like butter. 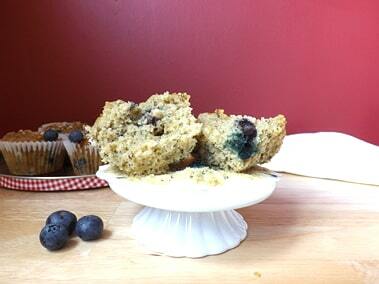 And there is just something so tempting about a basket of warm muffins sitting on the breakfast table. 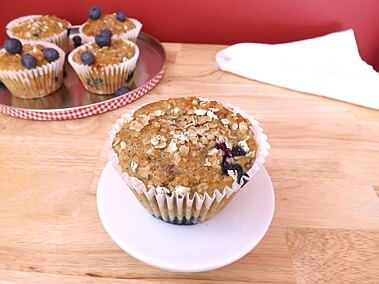 These ones in particular I have made very breakfast friendly, full too bursting with juicy blueberries I used fresh but you can use frozen, sweet mashed ripe bananas and rolled oats. To keep the fat content down, I used low fat buttermilk and only 5 tablespoons of olive oil for the liquid ingredients the mashed banana also helped to keep these super moist. Also didn’t use the yolk of the eggs to keep the fat content down a little and keep these as healthy as possible. I really like using buttermilk in my baking, again I know it can be a very American thing and it can be hard to find in our shops in the UK, usually only the larger supermarkets stocking it, but if you can get your hands on it please do give it a go. 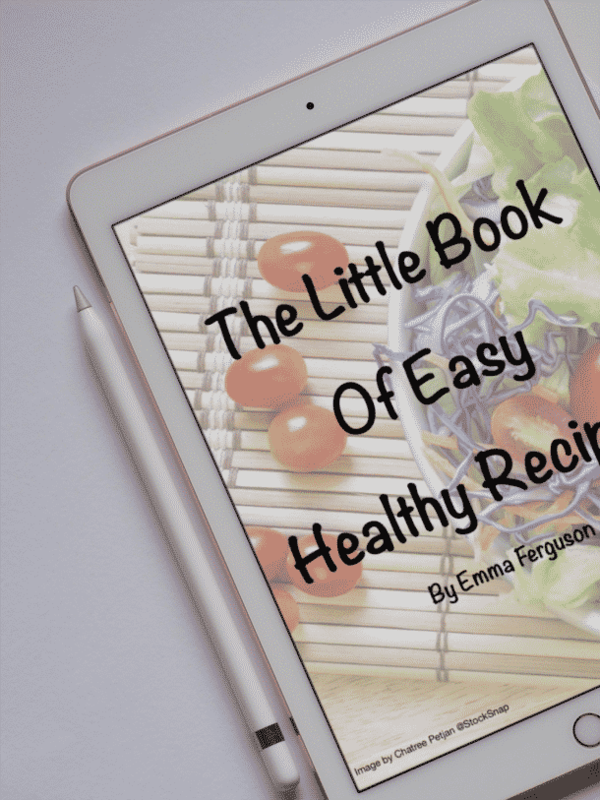 There are substitutes you can use, which I am sure will give you a good result like, adding white vinegar or lemon juice to milk I have even heard you can use a mix of milk and natural yogurt, check this out properly if you are going to use a substitution as I am not sure of the proper quantities you would need to make it. 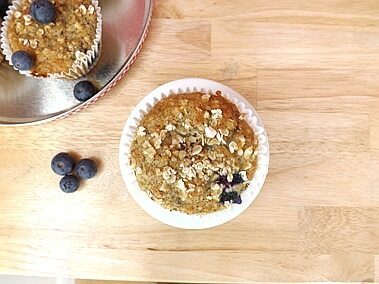 I also sprinkled the tops of these muffins pre baking with more rolled oats and a little sugar so they would have a nice crunchy top. 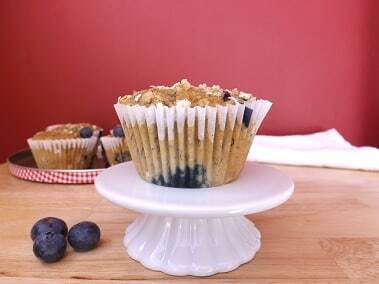 Rolled oats are tasty and healthy for you so that’s always a bonus. 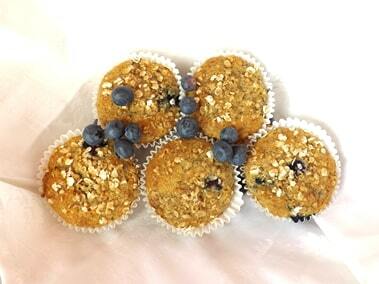 For an added kick of healthy I used self-raising wholemeal flour in these. The combination of the buttermilk, self-raising wholemeal flour and the baking soda kept these so light and fluffy. Not dense like I feared they would be, each bite was so light. 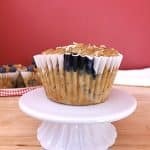 The main flavour is banana in these delightful muffins, but the burst of blueberries cut through it perfectly and they combine into a lovely fruity heavenly mix. 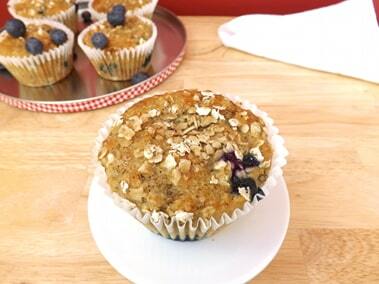 I really hope you give these super healthy skinny banana and blueberry muffins a go, you won’t regret it. 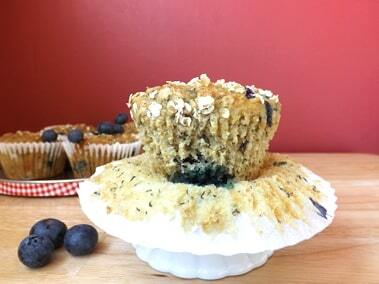 A skinny version of a fruity muffin. 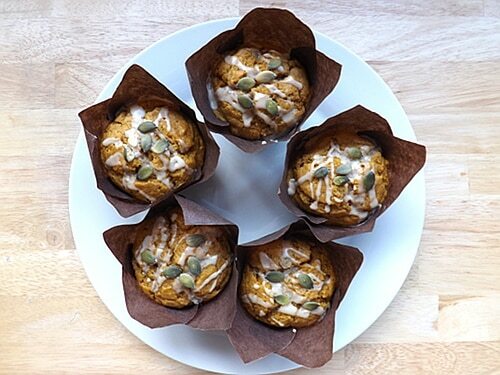 Preheat your oven to 180C / 350F / Gas mark 4 and prep you muffin tins with liners or lightly grease them. 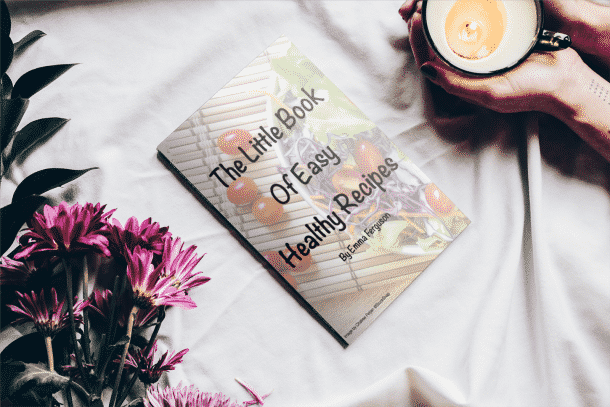 In a large bowl mix the flour, baking soda and sugar together until well combined. Add in the oats and combine. In another bowl of medium size, mash the bananas until smooth, stir in the buttermilk, olive oil and egg whites. Add the wet ingredients to the bowl of dry ingredients and mix sparingly until the mixture is just combined. Add the blueberries and just give the mixture one stir to combine them but no more. Fill the cases 2/3rds full. 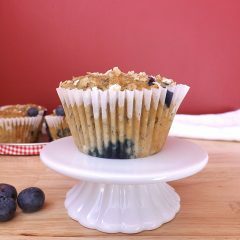 Take your extra tablespoons of light brown sugar and rolled oats mix in a small bowl and sprinkle on top of your unbaked muffins. Pop them in the oven for 18-20 minutes. Once baked take them out of the oven and allow them to cool in their tins for at least five minutes, then transfer them onto a cooling rack. These do taste really good still warm but are also really nice cold. They will keep in an airtight tin for 3 days. delicious! yes let’s get some fruit in these sweets! that’s how I get my 7 year old daughter to eat fruit willingly! check us out (my daughter and myself) at out blog crisiracakes.wordpress.com we will be following you! Hi Crisira, thanks for stopping by 🙂 Muffins and other bakes are great for getting kids and some fussy adults to eat fruit! I shall definitely stop by your blog to check out.